Recently the Manhattan School of Music in New York City presented a program entitled "Machito Forever, A Birthday Celebration", dedicated to the Grammy-winning bandleader, singer, maraca player, and composer. 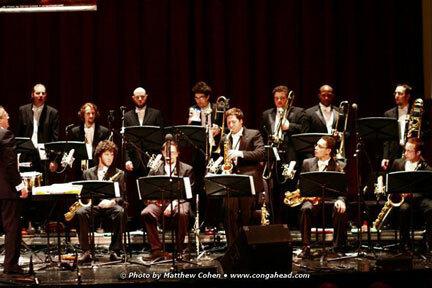 The program was conducted by Bobby Sanabria, who has performed and recorded with a veritable Who's Who in the world of Jazz and Latin music, as well as his own critically acclaimed ensemble Ascensión. Bobby's orchestra played eight tunes featuring students with support from featured LP artist and master conguero Candido Camero, who will celebrate his 85th birthday in April. Gene Jefferson, a veteran of the Tito Rodriguez Orchestra, was on hand to perform a tune. One of the songs performed was written and arranged by Gene Marlow. I was honored to provide an image from 1983 of the great Machito holding his Grammy.